This post has already been read 1982 times! KEARNEY – Ten finalists have been chosen for Big Idea Kearney, an event that promotes entrepreneurship in the community. 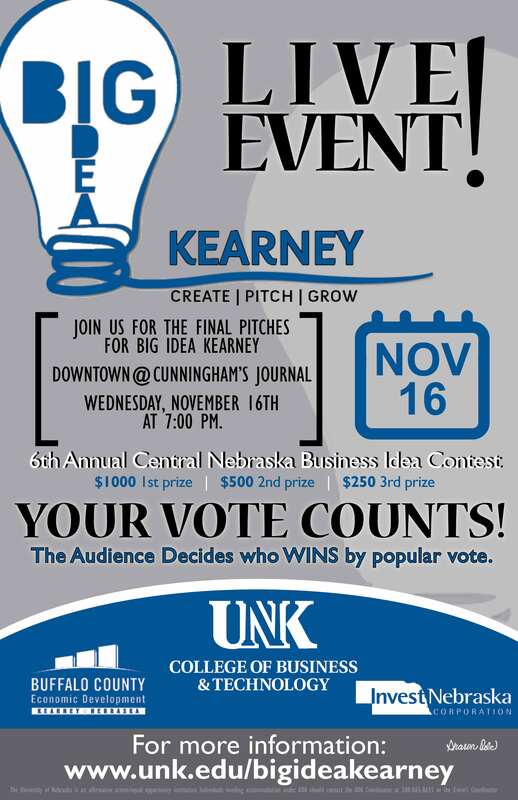 The finalists will pitch their business ideas at 7 p.m. Wednesday (Nov. 16) at Cunningham’s Journal at 15 W. 23rd St. The first-place winner receives $1,000, the second-place winner receives $500 and third place receives $250. Big Idea Kearney is open to anyone with a new business concept. The business idea doesn’t have to be a complete business model, just a description of the product or service, what need it serves, who the customers might be and how it would be made available to those customers. The purpose of the event is to support a culture of entrepreneurship in the area by providing those entering with feedback through networking with other entrepreneurs and community leaders. Big Idea Kearney is sponsored by The Economic Development Council of Buffalo County, Invest Nebraska Corp. and Center for Rural Research and Development in the University of Nebraska at Kearney College of Business and Technology. Past winners of the contest included business models for an oculus rift video game, double-sided peanut butter jar, automatic irrigation shutoff, hazelnut industry for food and biodiesel production, and hay bale mover.